Wise use of our natural resources is an ongoing process. These resources include soil, water, air, plants and animals. Reduction of soil erosion has long been a primary goal of the district. Construction of terraces and waterways, reducing tillage on cropland and seeding critical areas back to grass have been key objectives. Maintaining and improving water quality in the county is another primary goal. The reduction of nutrients, pesticides, toxins such as oil and antifreeze, and animal waste in runoff water through improved management practices are key objectives. To meet both state and local objectives the district has adopted some priority drainage areas. Even though both soil and water protection are our primary goals the priority areas currently selected are governed by water quality concerns. These areas have been determined to be most critical to meeting Total Maximum Daily Load (TMDL) requirements within the county. TMDL is defined as the total amount of a contaminant a water body may receive in a specified time period from point and/or nonpoint sources. TMDLs are identified by the Kansas Department of Health and Environment and approved by the United State Environmental Protection Agency. For more information on TMDLs, please see the KDHE web site. TMDL maps are slow to change, but they do. 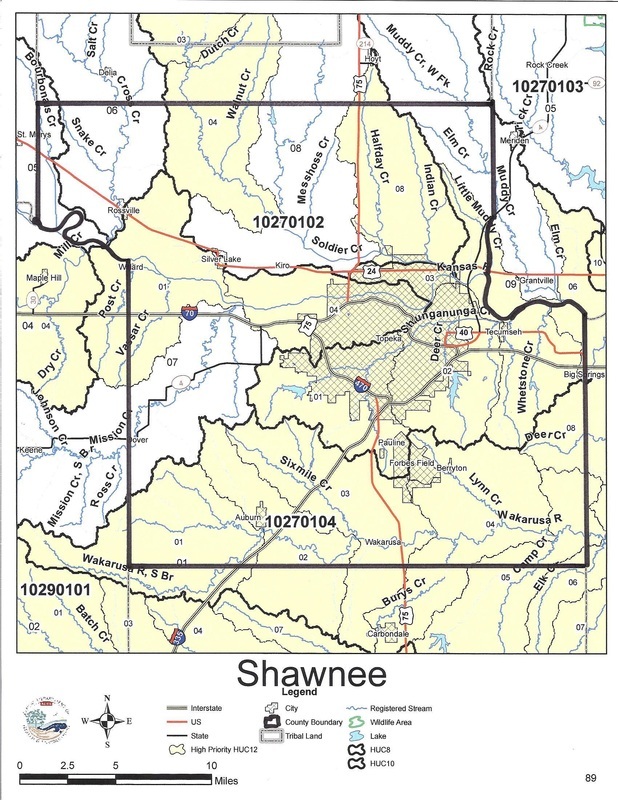 To the right is the 2012 map for Shawnee County.